Djembe repair and maintenance is a must for every conscious drum owner. Keep your drum in shape and it will last you many years! 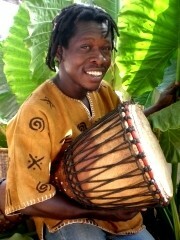 Mensah is a drum builder and percussionist in West Africa. He has been working with African drums all his life and has lots of tips and ticks in store for you. Fortunately, you don't need to be a professional to properly take care of your drum. With the help of Mensah and other drummers you can learn to do it all yourself. It's fun and relatively easy. Just ask for help below. A hand-made drum from West Africa is a piece of art. What somebody crafted with his hands, heart and great effort is worth receiving your best care. Proper handling can prevent a lot of trouble. At the very least, use a djembe case that protects during transport and storage. African drums are hand-made of natural materials and therefore prone to small imperfections. From time to time, you'll need to remove the old rope and redo the djembe knots and the vertical djembe stringing with a new one. Or you'll even have to replace the whole drum head because the skin is damaged. When the sound is off, your drumming skills are not necessarily the problem. Every djembe needs a tune up from time to time. Depending on the shape of your drum, there are various methods to tune it. You can have your teacher do it or just learn to tune your djembe yourself. What's with the ending knots on my djembe?